Both on letterhead of 41 Lennox Gardens, S.W.1. 28 December 1950 and 4 January 1951. Mary Endicott Carnegie was the daughter of William Crowninshield Endicott (1826-1900), Secretary of War in Grover Cleveland's first administration. She married the British politician Joseph Chamberlain (1836-1914) in 1888 and moved to England. After Chamberlain's death she married William Hartley Carnegie (1859-1936), Sub-Dean of Westminster Abbey and Chaplain to the House of Commons. She was painted by Sir J. E. Millais and John Singer Sargent. Catalogue of etchings by Robert Austin, A.R.E. [interleaved by Walker with material relating to Austin, 1926-1933]. London: Published by the Twenty One Gallery, Durham House Street, Adelphi, W.C.2, 1926. Austin (1895-1973) was a British etcher, engraver and watercolourist. R.A. Walker (born 1886), whose bookplate is on the front pastedown, was a connoisseur and Aubrey Beardsley scholar. Quarto, twenty-six leaves. Internally tight, clean and sound, in worn and stained half-leather binding, with 'ROBERT AUSTIN' in gilt on spine. The item contains a total of forty-seven reproductions of Austin's works, many gleaned from magazines, etc, and tipped in throughout. Autograph Letter Signed ('J. O. Sargent') from the Whig politician and editor John Osborne Sargent to the Boston abolitionist poltiician Charles Sumner, on his moving to New York to work as assistant editor on the New York Courier and Examiner. New York. 16 August . 3pp., 4to. Bifolium. 65 lines of text. Good, on lightly-aged paper. Addressed, on reverse of second leaf, 'To | Charles Sumner Esq. | Boston', with docketed date giving year. 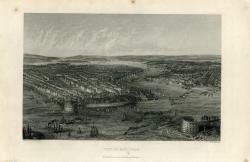 He writes that he had hoped to see Sumner before leaving Boston. 'Will you give my best regards to your friend Dr. Lieber, and assure him of my sincere obligations for his unsolicited & therefore more acceptable kindness.' 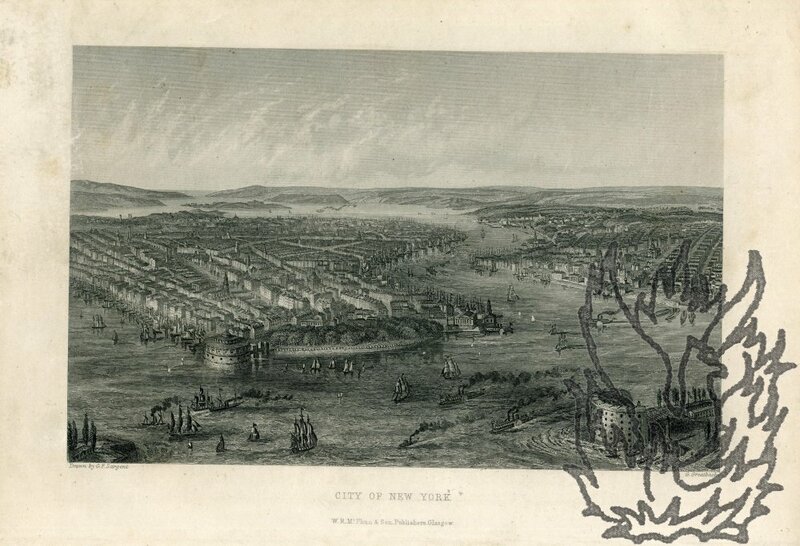 He is 'in all respects' pleased with his 'situation' in New York: 'It is every wise more independent - & more "uninterfered-with" than ever; besides opening a large field and better prospects'. 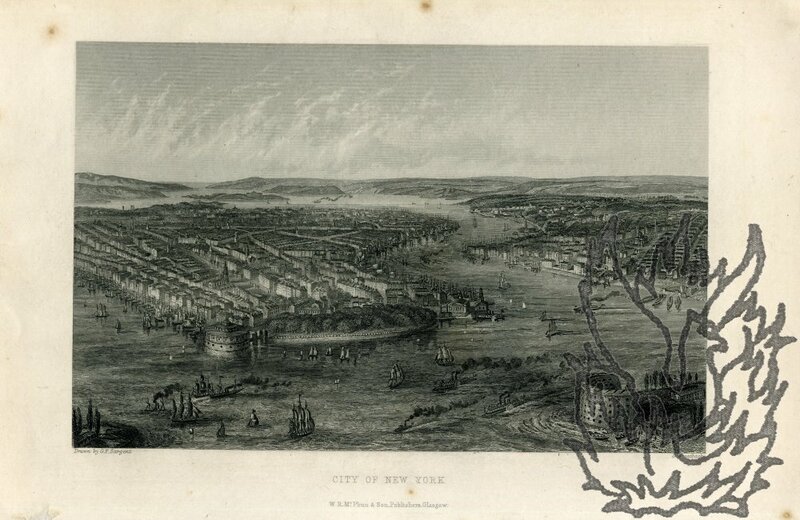 Original steel engraving, drawn by G. F. Sargent and engraved by G. Greatbach, captioned 'City of New York'. Dimensions of print 12.5 x 19.5 cm. On paper 16 x 24.5 cm. Good clean impression, with six or seven spots of foxing in the margin and a little wear in the bottom left-hand copy. 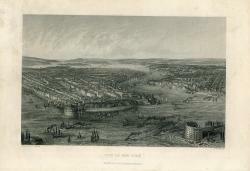 Striking detailed view of the city with sailboats and steamships in the harbour, and the major buildings and layout of the streets clearly portrayed, with the environs in the distance. Scarce: there is little information to be gleaned concerning this print. Autograph Letter Signed ('Seymour Lucas') to 'Mr Wright' [W.H.K. Wright, editor of the Journal of the Ex-Libris Society?]. 17 April 1906; on letterhead of Priory Place, Blythburgh, Suffolk.